RIDGID introduces the 18V OCTANE Bluetooth 3.0 Ah Battery (2-Pack). The OCTANE Bluetooth 3.0 Ah Battery features extreme runtime and best-in-class intelligence. This battery offers 2X more runtime when compared to standard 1.5 Ah lithium-ion. With Bluetooth technology, the jobsite is opened up to many features that will increase productivity throughout the work day. While providing increased performance with all RIDGID 18V tools, OCTANE batteries provide maximum performance when paired with OCTANE tools (not included) for high demand applications. These batteries are backed by a 3-Year Limited Warranty. Chargers sold separately. The advanced EGO POWER+ 56-Volt Arc Lithium battery uses industry-leading Arc-Lithium technology to deliver Power Beyond Belief and is compatible with all EGO outdoor power equipment. Keep-Cool battery technology keeps each cell cool for long life and work in the most extreme conditions. The EGO 56-Volt Arc Lithium Battery 7.5 Ah delivers the longest run time of any EGO POWER+ battery. EGO POWER+ batteries deliver long-lasting power, rapid charging and durability in all weather conditions. The unique arc design keeps each cell cool for long life and hard work in the most extreme conditions. EGO POWER+ batteries provide Power Beyond Belief to EGO outdoor power equipment. 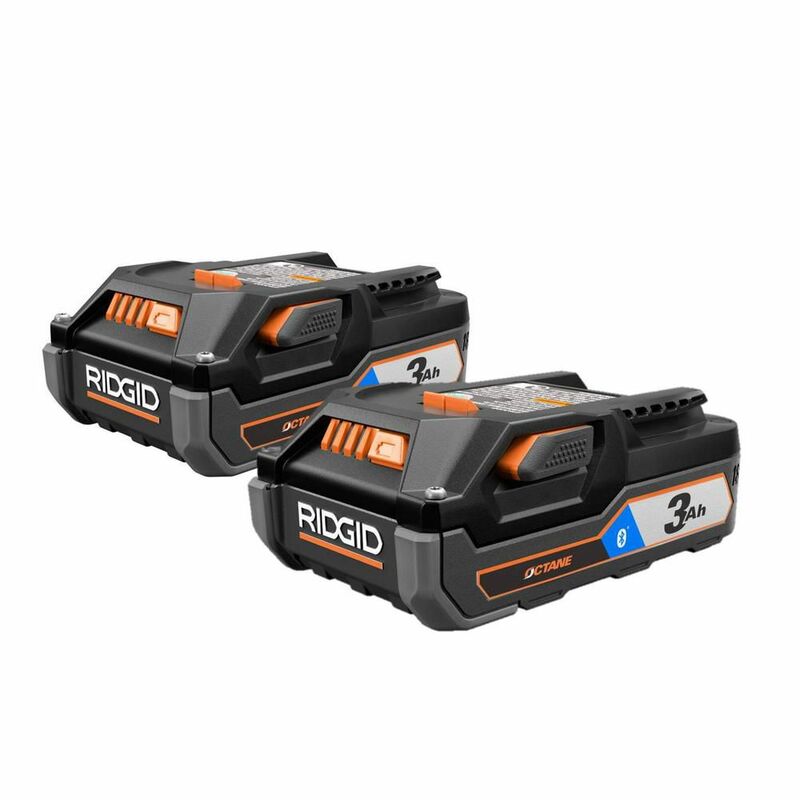 18V OCTANE Bluetooth 3.0 Ah Battery (2-Pack) RIDGID introduces the 18V OCTANE Bluetooth 3.0 Ah Battery (2-Pack). The OCTANE Bluetooth 3.0 Ah Battery features extreme runtime and best-in-class intelligence. This battery offers 2X more runtime when compared to standard 1.5 Ah lithium-ion. With Bluetooth technology, the jobsite is opened up to many features that will increase productivity throughout the work day. While providing increased performance with all RIDGID 18V tools, OCTANE batteries provide maximum performance when paired with OCTANE tools (not included) for high demand applications. These batteries are backed by a 3-Year Limited Warranty. Chargers sold separately. 18V OCTANE Bluetooth 3.0 Ah Battery (2-Pack) is rated 4.8 out of 5 by 25. Rated 5 out of 5 by Bones68 from I’m very impressed, great features. ... I’m very impressed, great features. Rated 5 out of 5 by HomeDepotCustomer from Batteries are awesome. I love how you can Bluetooth them... Batteries are awesome. I love how you can Bluetooth them to your phone and know where they are located at. Rigid has been stepping up their cordless tools up so these batteries give your tools more power. Rated 4 out of 5 by Lizzardking from There is not the ability to have the life time... There is not the ability to have the life time warranty so, I may return them. Rated 5 out of 5 by maintenanceguy from Ridgid tools are really good and this 2 pack battery was on SALE. Ridgid tools are really good and this 2 pack battery was on SALE.